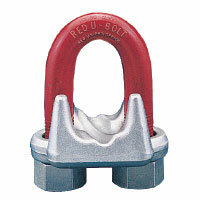 Delta Rigging and Tools stocks 3 styles of Forged Wire Rope Clips for use as Wire Rope end Fittings. G-450 Red-U-Bolt® Clips, G-429 Fist Grip Clips and G-460 Soft Eye Bundle Clip, and the G-461 Thimble Eye Bundle Clip. 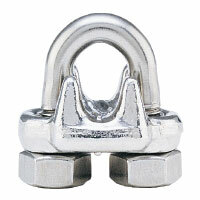 Wire Rope Clips are used for forming eyes in the ends of wire rope by following an installation procedure provided by Crosby® and OSHA 1926.251. Efficiency ratings of a properly prepared loop or thimble eye terminations for clip sizes 1/8" through 7/8" is 80%, and sized 1" through 3-1/2" is 90%. U-Bolt style clips are not recommended for elevator, personnel hoist and scaffold applications, refer to ANSI A17.1 and ANSI A10.4. G-460 Soft Eye Bundle Clip and G-461 Thimble Eye Bundle Clips are used to hold pre-slinged choker eyes in position. 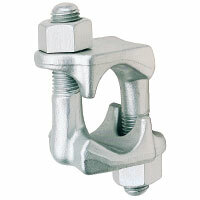 These Bundle Clips reduce the rigging and handling time of drill pipe, casing and other down hole tubulars at shore bases, supply vessels and offshore installations. 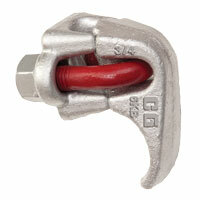 Click on the images below to view more information on wire rope clips and fittings in our catalog.